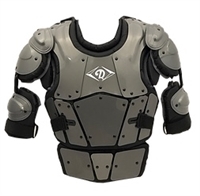 A low-profile chest protector with high-level protection. 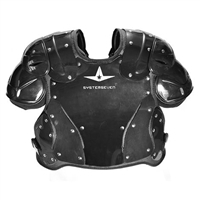 This chest protector features a patented adjustable breastplate for optimal fit. The iX3 Series Chest Protector combines quality construction with added customization for excellent protection. A true form-fitting softshell design chest protector. Achieve excellent range of motion with the ergonomic armor system that contours to your body. This ergonomic softshell chest protector is extremely lightweight as less 2 1/2 pounds. Keep your chest protector in its correct spot with the Stay-Put. Your chest protector will never slide down again. The Champro shoulder extensions give added bicep protection when used with the PRO-PLUS Chest Protector. This abdomen extension fits the Champro PRO-PLUS Chest Protector for added safety.